Browse our AV Cart category where you will find all types of Audio Visual Carts. All of these products feature quick shipping (1-2 days) and Free Shipping. Couple that with our Best Price guarantee, and you have definitely found the right place to shop! Of special interest is our Customizable AV Carts where you can build and design your own cart. AV carts, also called audio visual carts, help you get all your audio visual tools, equipment, and accessories from place to place. What are some features of these products? They might feature wheel brakes and a storage drawer. Those are just standard components. All audio visual carts need to be able to move around. A top shelf cushion is also a good idea, or cushions in general on any of the devices, because it helps you transport delicate or sensitive equipment. Non-slip vinyl surfaces also help the gear stay in place when it’s on the cart itself. That’s especially important because you don’t want any of it tipping over. The top shelf, or any shelf on the product, should have a non-marking bumper so that it will protect furniture and walls in case it bumps into anything. Remember, you will be moving it around a lot. A power cord, switch, and circuit breaker should also be included as an essential part of every one of these devices. Plus, the wheel brakes should have swivel casters to stop any movement that’s unwanted. Some audio visual carts will have cabinets so that you can stow away important items without putting them in danger from exposure. Pull-out shelves at the perfect height are also great for keyboards and computers. This is an ideal feature if you have to make a lot of presentations. The slip-top surface is one of the most critical features as well. You don’t want any of that important audio visual equipment getting damaged. Large shelves should hold the best-selling document cameras on the market. Make sure that the shelves are big enough. 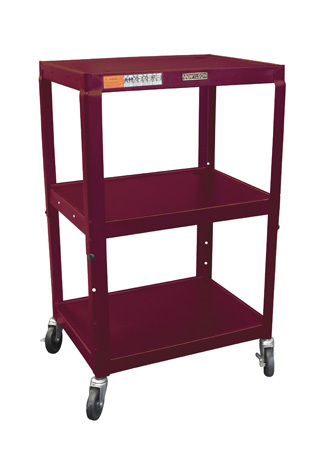 You don’t need to purchase an audio visual cart that’s too small to make the ever-expanding needs of your school, museum, or business. You can get a really decent one for under $500, but there’s no reason you shouldn’t spend more if you have a big budget like in your education or art department. Try to ask the supervisor if you can go all out on an audio visual cart that is going to hold up for years to come. These hold the most important pieces of equipment, and you wouldn’t want anything to happen to it. What about some customizable features? Yes, you can always get the products in multiple colors, sizes, and orientations. You can get audio visual carts that you assemble yourself. You can choose how it looks. A lot of these all-purpose carts can also be used as audio visual carts. You can use them for multiple things in a business or office. That’s a great thing to be able to do because they save you a lot of money in purchasing all different sorts of transport and storage products because you have an all-in-one, essentially. What are some materials you might see mentioned in conjunction with audio visual carts? Audio visual carts have a lot of tough components like ball bearing casters, bolt assembly, 20 gauge steel shelves, and full swivel ball bearing casters. In other words, they’re made out of some really heavy-duty materials. They’re meant to hold serious audio visual equipment, and there’s no messing around when you go with one of these products. They’re made to hold the heaviest, toughest audio visual equipment. Most will be able to hold up to 200 pounds or more, so long as the weight is distributed between the three shelves, if it’s a multi-shelf unit. Some units are stronger than others, of course. What else should you know about audio visual carts? Many of the best brands will carry lifetime guarantees. Since you’re spending so much money on one, and since it’s going to become a huge part of your day-to-day activities on whatever job site that you’re at that actually requires it, it necessitates some kind of warranty. You just can’t afford to have something go wrong with it. Sometimes, they are called boardroom presentation carts. They are not just used in schools. They are used in businesses, offices, and meetings every day. These audio visual carts are essential parts of getting education done and keeping business moving forward. It’s a good idea to make a solid investment in one, one with a lifetime manufacturer’s warranty, and not skimp on details or features. Purchase a high-end audio visual cart because the additional features are really going to make a difference in how easy it is to pull off a great presentation. You’ll be missing those features if you get a lower-priced models. You won’t be able to easily go back and add them on either. You’ll just lament that you didn’t purchase one of the higher-end models when you had a chance. What will a great audio visual cart hold? 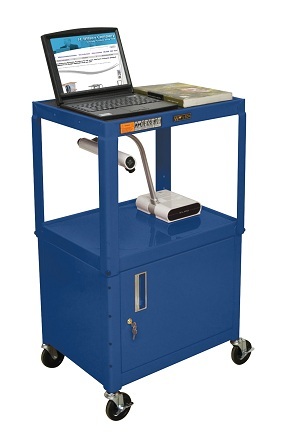 An excellent audio visual cart will hold just about everything, including visualizers, document cameras, LCD projectors, and notebook computers. A good will also have a lockable storage cabinet, as mentioned previously, for the very important items that need protection from the outside exposure. Cord wraps, surge projectors, and indicator lights should all come standard on audio visual carts. Lifetime manufacturer warranties are another essential part. For the Best Deal on Audio-Visual / AV Carts make sure to shop exclucively at Handtrucks2go.com!